Fruitshop takes the simplicity of a traditional slot game and brings it into 2018 with a fun and creative setting. It joins a collection of fruit slots – brought by the NetEntertainment team of developers. The game is adaptable to various desktops such as computers, tablets and mobiles – including both Mac and Windows products. The game will reward you with – if nothing else – the gift of nostalgia. But have no fear, Fruitshop provides colourful graphics which allows players to appreciate where it all began; without needing a dramatic theme. It is a 5 reel game, with 15 pay lines. There are some exciting bonus futures as well, look out for the wild multiplier which doubles your win and free spin elements! The game is worth checking out for many reasons, but the free spins features make it an attractive slot game to play online! Find more at Wizard! Netent is based in Sweden and were founded in 1996 since then they have proved themselves as producers of high quality, slot online games developers. They are known for being amongst the first to produce software that uses HTML5. The company is currently developing on their mobile gaming works. Here, they demonstrate their ability to play around with simplistic theming in a creative manner. Betting can be set between 1 and 10 and there is a ‘max bet’ option to make it easy if you are feeling lucky! With ease in mind, Fruitshop also has an autoplay element which is effective and allows you to sit back and watch the reels spin away! The paytable can be accessed by clicking the symbol on the left of the screen, this will display information regarding winning symbol combinations and how they will financially reward throughout the game. Bonus features and rewards make this among the best video slots online! The wild symbol comes in the form of the traditional Joker who will replace other symbols in the reels and, ultimately increase the chances of winning. Joker symbols will also pay out double when landed in a winning formation, so they are worth stacking up! However, the joker symbol can only be used once in a line. The game can be played from 15 pence to 150 pounds per spin. Free spins can be triggered through effortlessly landing 2 cherry symbols on the reels. 2 will offer 1 free spin whereas, 5 cherry symbols offer 5 free spins. Free spins will also be awarded through other fruit symbols. 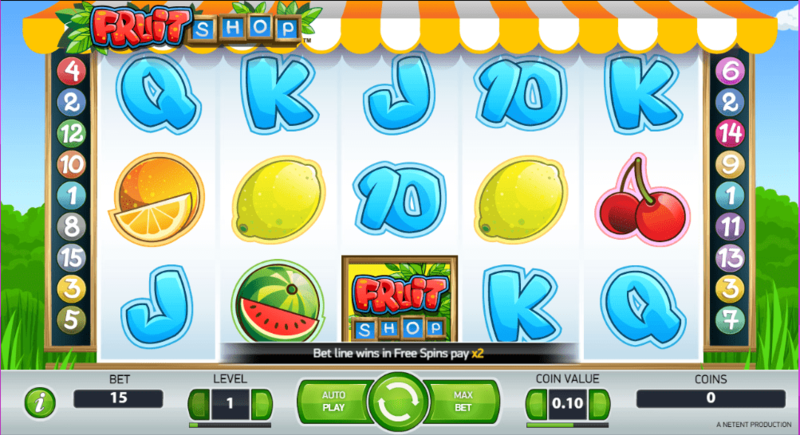 Fruitshop is a relatively simplistic online slot game which provides fun for a range of players. Its traditional style rewards the developers for celebrating the old school essentials to the world of slot games. Of course, there is much competition to Fruitshop and competing developers have certainly had a go at creating a drive through a road of reflection and nostalgia. Fruitshop keeps players involved through offering seven different coin values and 10 bet levels which gives players choice whilst spinning. So, for a burst of colourful tradition and a game which centres itself around free spins, get involved and play Fruitshop! Or try Chicago Gangsters!